If you're a golfer, you've probably heard of it, and if you know a golfer, you know you've just found one of the best gifts (or gags) ever! 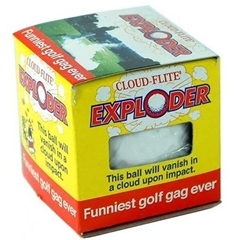 This is the LEGENDARY Exploding golf ball. Designed in Australia, there isn't really much to explain about the Cloud-Flite Exploder. Drop it on the fairway for an unsuspecting golf buddy to hit, or swap out their favourite ball on the tee. Whatever the situation (and providing they can actually hit it properly), the ball will vanish in a cloud of smoke on impact. I wouldn't be without one in my bag, check out the image and you'll see why!